According to the 2006 Program for International Student Assessment, the average science score of U.S. students lagged behind those in 16 of 30 countries in the Organization for Economic Cooperation and Development, a Paris-based group that represents the world’s richest countries. The U.S. students were further behind in math, trailing their counterparts in 23 countries. In the midst of these reports of lagging performances in science and math, and the relatively low percentage of today’s graduating seniors considering careers in engineering and technology, the National Engineers Week annual Future City® Competition stands out as a unique way to inspire America’s middle school students to explore the possibilities of a career in engineering: by challenging them to combine the use of futuristic concepts with solid, proven engineering practices to design a city of the future. 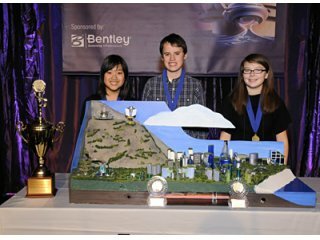 This year’s amazing Future City winners, Luke Churchill, Emily Yue and Ruth Swallow, are 13-year-old middle school students from Davidson IB (International Baccalaureate) Middle School in Davidson, North Carolina. Together, they worked diligently and creatively to create ‘Mamohatra’, a city of the future which is eco-friendly and provides affordable housing to people who have lost their home due to a disaster or a financial crisis. If you have ever dreamed of creating a place where people would be free from some of the problems often found in today’s cities, then this story is for you! Perhaps it will inspire you to not only think about your own future, but to take action to help design the future world you’d like to live in. Who knows? Maybe you’ll even be inspired to get your friends to create your own Future City team and design a future city for next year’s competition! Don’t forget: If you, or a young person (or persons!) you know, has an amazing project you are involved in, or a special skill, talent or ability you want to tell the world about, be sure to let Amazing Kids! know about it! Simply complete our Amazing Kids! of the Month award online nomination form, visit our AKOM nomination information page (http://www.amazing-kids.org/nomination.htm#nomination) or email us! The Future City Competition, now celebrating its 18th year, is an educational engineering program for seventh and eighth-grade students combining a “stimulating engineering challenge with a ‘hands-on’ application to present their vision of a city of the future.” Participants have an opportunity to explore multiple disciplines of the engineering profession while learning engineering and other important related skills, such as teamwork, communication and problem solving. The Future City Competition is held each year by the National Engineers Week Foundation, a formal coalition of more than 100 professional societies, major corporations and government agencies dedicated to ensuring a diverse and well-educated future engineering workforce by increasing the interest in engineering and technology careers among young students. This year’s theme for the competition was providing an affordable living space for people who have lost their home due to a disaster or financial emergency. To participate in the contest, the students had to create affordable homes for people who were facing a disaster or a financial crisis, and were earning only 50%-80% of the media income of the surrounding city. The living space had to be sustainable and energy efficient with a low-carbon footprint. The 18th Annual National Engineers Week Future City® Competition started in last Fall, with more than 33,000 students from 1,100 middle schools in 39 regions across the United States participating. The qualifying competitions for each region were held in January. The finals were held this past February 13-16 at the Hyatt Regency Capitol Hill, in Washington, D.C. The grand prize winning city of the future, “Mamohatra” was announced at the finals. Mamohatra was engineered by three 13 year old students, Luke Churchill, Emily Yue, and Ruth Swallow, from Davidson IB Middle School in Davidson, North Carolina. In order to design and build a city of tomorrow, Ruth, Luke and Emily worked as a team under the guidance of their teacher Jay Durant Hager and mentor, Dane Horna, an engineer with S&ME, Inc. in Charlotte, North Carolina. 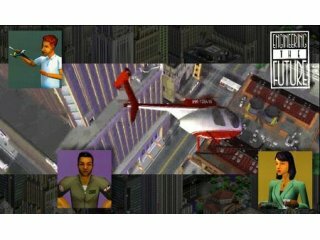 They first designed the cities on a computer using the SimCity™ 4 Deluxesoftware and then build a three-dimensional, tabletop model to scale. To ensure a level playing field, all models had to be made out of recycled materials and had to cost less than $100 to build. They also had to write a brief narrative describing their project and had to present and defend their designs at the competition before a panel of engineer judges who test the depth of the teams’ knowledge. The experience has been educational in several ways for each of the participants. Apart from learning about new avenues in the field of engineering, the students have also learned about teamwork, problem solving, persistence and success. Luke, Emily and Ruth each want to pursue a career in engineering and believe that the Future City competition has provided them with the right platform to do that. “I’ve always wanted to be an engineer, even though I wasn’t quite sure what an engineer was,” admits Luke. “When I was little I wanted to be a mechanical engineer because I wanted to design tanks. I joined this competition because I wanted to improve on my teamwork skills, problem solving skills, and learning skills. I also wanted to know what it would be like to actually be an engineer. This competition was definitely worth it,” he adds. Amazing Kids! congratulates these amazing and inspiring young engineers. We know the future is very bright indeed, knowing there are such talented future city designers like Luke, Emily and Ruth in our midst! Keep up the amazing work, team! Know any more cool science, technology, math or engineering websites for students? Email us and we’ll pass it on to Brad, Amazing Kids! Online Magazine’s new Sci-Tech Kids! student columnist! He’s always looking for new cool science sites to review! editor@amazing-kids.org. I hope you will continue to build a good community here, I’ve quite enjoyed the experience of reading your blog so far.